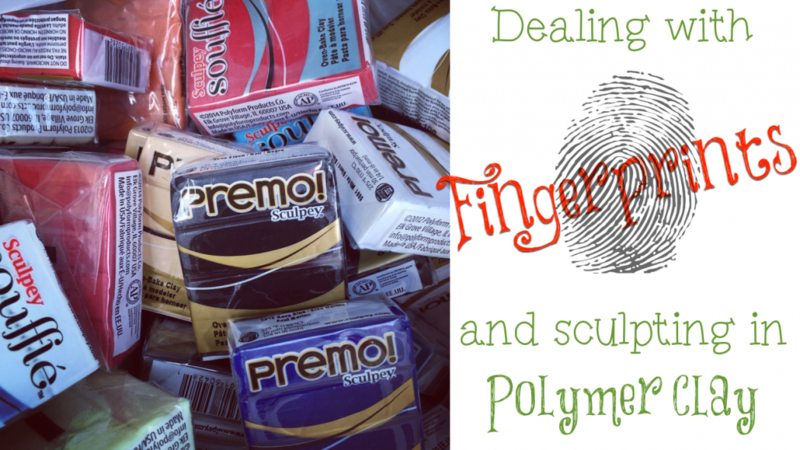 Home / Polymer Clay / Hints, Tips, & Tricks / Fingerprints in Polymer Clay: Two Tips to Banish Them! There are a lot of easy and clever ways to get rid of fingerprints, but what if fingerprints never happened in the first place? My method for helping you avoid fingerprints in polymer clay is based on that principle. My aim is to teach you a way to minimize getting any fingerprints in polymer clay in the first place with two easy tips. Below is a brief 6 minute video where I will share those two tips with you, or you can read about them below. I will not belabor this point as I have devoted an entire article and video to this one tip already. Please CLICK HERE to watch the video and read the article. For artists who are new to the sculpting world, one of the things that is often foreign to them is the mastery of something that I refer to as “soft touch.” It is the ability to transform, manipulate, and move clay using only the slightest of touch. This “soft touch” is a literal soft touch, delicate press, or gentle finger swipe. Often when new sculptors (and sometimes intermediate ones) come into my studio for lessons this is their biggest challenge. This ability to be gentle and use delicacy when transforming their polymer clay is almost nonexistent. I call this the “smash effect.” We’re always in such a hurry that we forget to take our time. The result? We smash everything, often unintentionally. Gentleness & patience is almost a foreign concept. Just like learning to play the piano, learning to sculpt and have a “soft touch” takes time & practice. Polymer clay (when properly conditioned) is extremely malleable. It doesn’t take a lot of pressure to transform clay into the desired shape or placement. By forcing the clay into position with a firm pressure we leave behind heavy fingerprints and the dust and dirt that comes with them. Mastering a “soft touch” will go a long way in making fingerprints in polymer clay a thing of the past. Have a question you want answered in an upcoming Q&A video? Leave it in the comments below. I did learn a new trick just before the heat kicked in and that was using the liquid Fimo clay worked better at cleaning my projects and also keeping the clay moist with its natural oils I had a piece of clay that even with the heat would not soft enough to do what I was wanting so I was brushing on a small amount of the liquid clay at a time till I finally found that sweet point in the clay not to hard not too soft lol but in the process of doing this I noticed all marks were removed. You are very welcome! Thanks for sharing your tips too. I’m glad to have you join us. Chime in here on the blog any time. You’re very welcome. I’m glad you found it so useful! excellent video on fingerprints, I had no idea how hard I was pushing on my clay until I saw this video, and it makes so much sense. thanks Katie for this valuable tip, I will be working with a piece of scrap clay to master the “soft touch”. That’s great Jennifer! Good luck – I know you can do it!